Today is the premiere for the movie Paul. Now, I know a lot of you probably haven’t heard of Paul but it’s the newest venture from Simon Pegg and Nick Frost. Two stars who I love. Erica and I are off hoping to get Simon Pegg on our Star Trek posters and hoping Sigourney Weaver is going to show up as well. Erica really needs Simon Pegg bad… Scotty is going to join us as well hoping for Seth Rogan! CB is even in the house! We are all out in full force for this one! 3:34 p.m. – I just got here. CB held me a spot on the barricade, but there’s not enough room for Scotty and Erica. So, I take my sweater and wrap it around the barricade a few people down to make sure they got a spot. 3:46 p.m. – I just texted Scotty that he should try and get here soon. The barricade is really filling up. It’s getting to be summer and a lot of tourists are in town. I texted Erica the same thing. 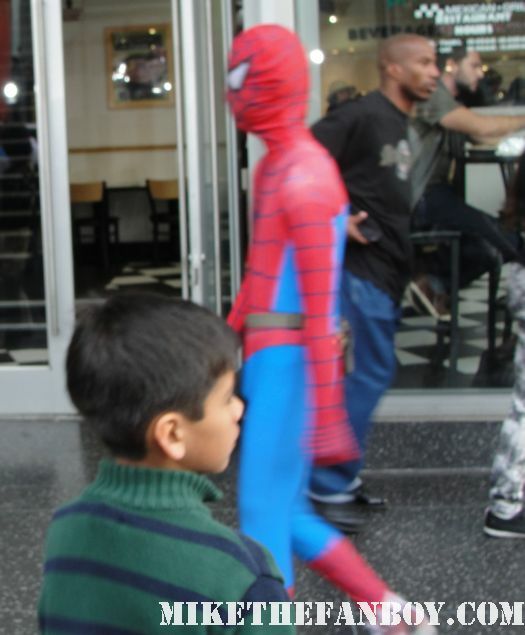 4:02 p.m. – Wow, a girl or girlesque person is walking down Hollywood Blvd. 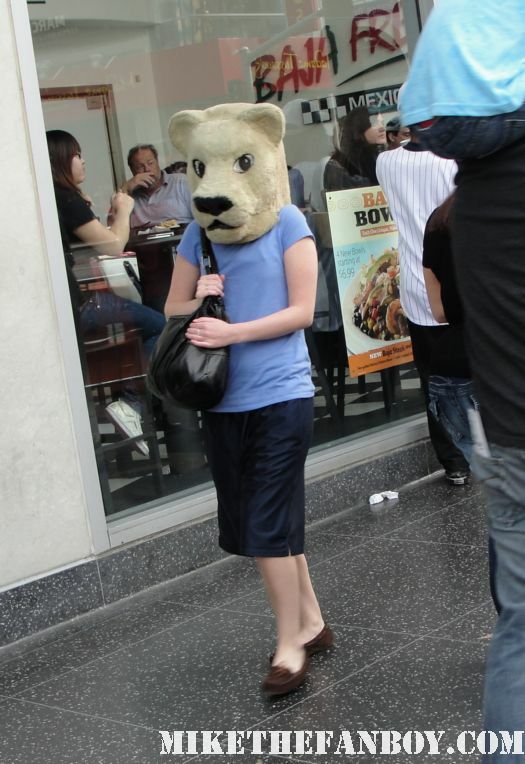 with a bear head on. 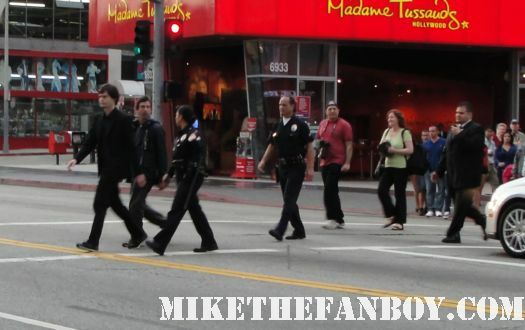 I don’t think she’s a “Hollywood character” but ummmm why would you walk down Hollywood Blvd. with a bear head on? 4:49 p.m. – CB is running back and forth. I think he’s trying to be stealthy, but yet I’m not sure. 5:17 p.m. – Time is getting short now. The security just moved all the Paul movie posters to the red carpet. 5:49 p.m. – I think that the carpet starts at 6:30 so hopefully it won’t be too long now. 6:05 p.m. – Security is all hovering… I always like 6:00 p.m. cause it’s about to start and there’s so much promise. 6:46 p.m. – They are both coming over together! Oh crap! 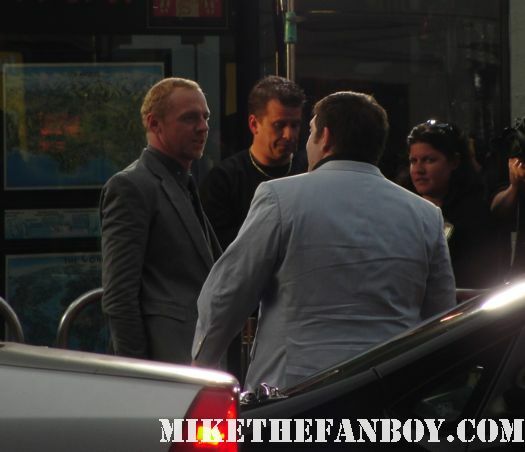 6:47 p.m. – Simon Pegg and Nick Frost are signing up a storm. They are so nice! 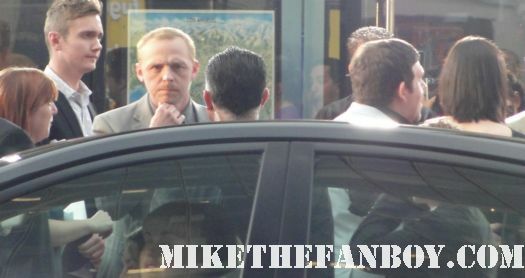 Simon is doing some photo opps, and so is Nick Frost! 6:48 p.m. – They are really taking their time. 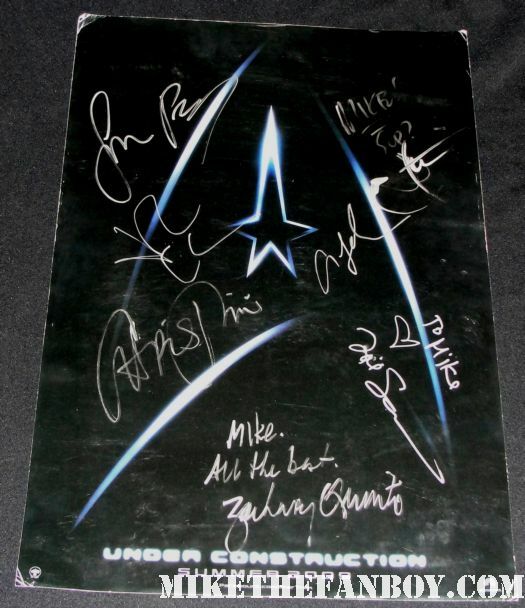 6:51 p.m. – Erica just got her Star Trek poster signed by Simon Pegg, and I think her Paul poster as well. 6:52 p.m. – Nick Frost is coming to our end. I have my Paul poster out for him to sign, and then I’m like… Like wait Nick! I fumble around and whip out my Hot Fuzz DVD. I asked him if he would mind signing my DVD. He was like… “Sure!” Such a nice guy! 6:53 p.m. – Simon was coming around now. 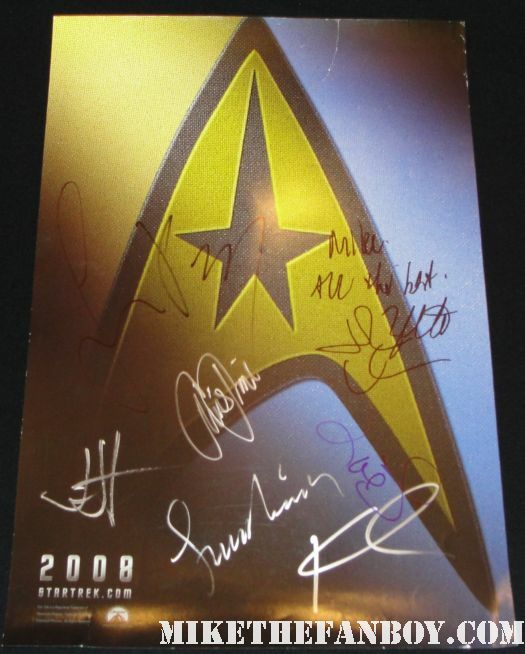 He signed my Paul poster and then I asked him to sign my Star Trek poster. He was like, “Do you have silver for this?” I was like, “But of course!” It was my Grey Poupon moment! He signs the Star Trek poster in silver and heads out. 6:54 p.m. – My friend Frank was here and was helping me get my other Star Trek poster signed. Simon missed that one. Dammit! 6:55 p.m. – We decide to try and get them on the way back to the crosswalk. 6:57 p.m. – Simon Pegg is heading back and Frank holds the poster out. Simon stops and signs it for him! Dude, such a rad dude! 7:01 p.m. – Another car just pulled up. It’s Bill Hader. Everyone calls out for him. And he immediately starts to come over. 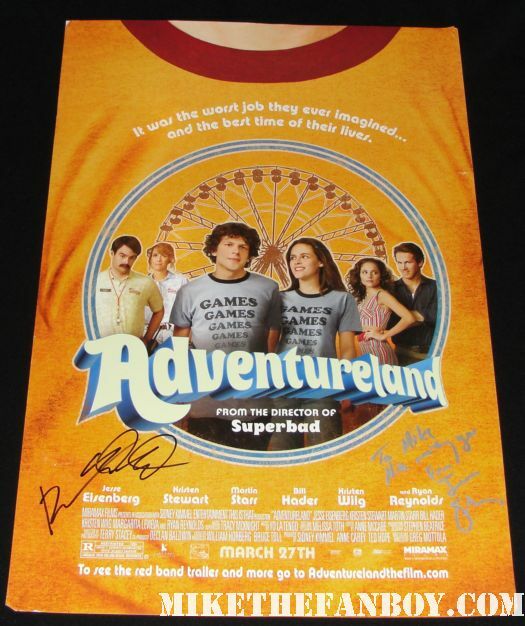 I have my Adventureland poster for him. 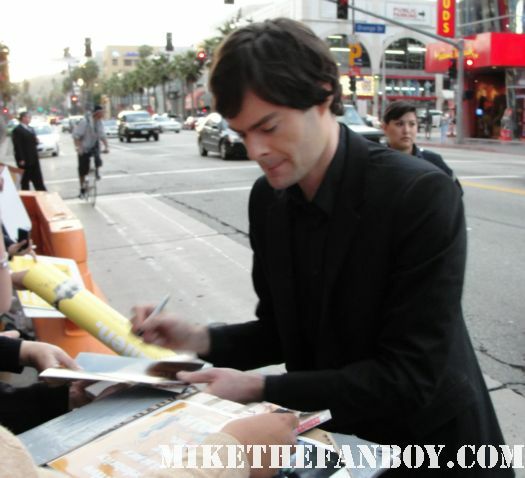 7:03 p.m. – Bill Hader is signing autographs for pretty much everyone. CD gets him to sign Pineapple Express and I get him on Paul and Adventureland as well. 7:04 p.m. – Then Bill Hader takes off almost right after he signs for us. Very cool. 7:11 p.m. – Oh, Seth Rogan! Everyone goes crazy. He waves… Come on Seth… Nope, he is just not having it. Ah well… I hear he’s usually pretty nice so I give him a pass on this. Well, no Sigourney Weaver, which makes me sad, but at least I got Simon and Nick. And getting Bill Hader was a nice surprise. More and more premieres are getting harder and harder… ah well, what can you do right! Wild Los Angeles Movie Premiere! Reese Witherspoon! Laura Dern! And More! 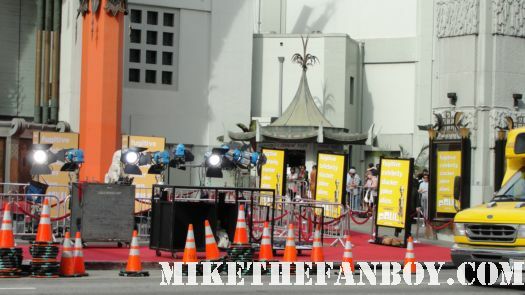 Battleship Los Angeles Premiere Report! Erica Tells All! With Liam Neeson! 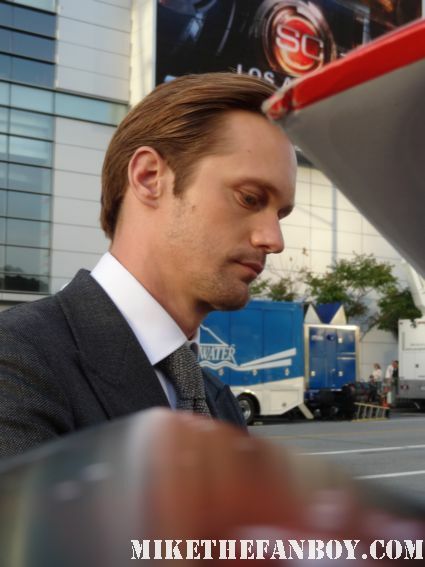 Alexander Skarsgard! Rihanna! Taylor Kitsch! Autographs! Photos! Chuck’s Report from The Source Code Premiere in Austin TX! Jake Gyllenhaal! Michelle Monaghan! Seth Rogen did in fact sign after the premiere. He signed both my cast shots. Apparently, Naomi Watts and Liev Schrieber both attended the premiere as well. Overall, I’m really happy to get Simon and Nick.